19 And what is the exceeding greatness of his power to us-ward who believe, according to the working of his mighty power, 20 Which he wrought in Christ, when he raised him from the dead, and set him at his own right hand in the heavenly places, 21 Far above all principality, and power, and might, and dominion, and every name that is named, not only in this world, but also in that which is to come: 22 And hath put all things under his feet, and gave him to be the head over all things to the church, 23 Which is his body, the fulness of him that filleth all in all. Spiritual warfare has become the dreaded but silent doctrine; arousing both curiosity and interest in the Church. However, many do feel inhibited from openly talking about it; due to innate misconceptions of some or whole aspects of its teachings that are difficult to assimilate and comprehend. Some Christian institutions and denominations prohibit their ministers from talking about spiritual warfare in the context of deliverance, since in their view such perceived as giving undue and unnecessary credence to the Devil and his abilities. However, such prohibition is not born out of a genuine care and protection for the flock in their care, but driven mostly by fear and repercussion of what the Devil and subversive spirits might do to those who venture into spiritual warfare in the context of deliverance. Strangely enough, this ambivalence characterised by fear of anything to do with the Devil is primarily responsible for the lack of spirituality across churches all over the world, especially Western Christianity. It is why incidentally, growth in eastern mysticism all over the Western world is at an all time high and the church thus far has had no tangible response. Put simply many within the Church do not see any harm in dabbling into spiritual practices that can impede or derail their destiny in God. These spiritual practices are alien to their call in God through Christ Jesus, which not only makes them spiritually vulnerable, but prime candidates and targets for spiritual attack and manipulation. Still there are those who assume that the subject can be better treated in an entirely different context where primitive beliefs in spirits still permeates cultures, societies, and traditions in the great continent of Africa. This common misconception and misinformation is destined to keep one sedated under the perilous influence of the Devil. Africa, Asia, parts of the Caribbean, West Indies and Latin America all spring to mind, when most think of belief systems indulgent of spiritual warfare practices whether it be for good or bad. There is a view purporting that countries or indeed contintents that are less scientifically advanced turn to practices of spiritual warfare in the hope of overcoming diseases, illness and sicknesses for which there are cures in countries that are most scientifically advanced. There is a long standing assumption that purports reason evidenced by science alone has eradicated belief formerly held in spirit beings and God. While science has come a long way and our reason has no doubt improved, all of this put together can never discount the existence of the spirit world. 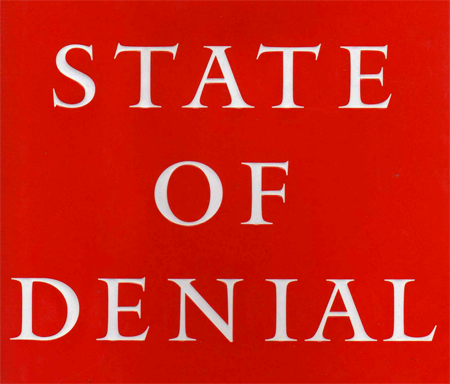 Even if we choose to believe they do not exist, then it is to our detriment and not to our salvation that we do so. Scepticism that exist about the spirit world pervades much of the critical thinking in modern theology evidence by the revisionist approach in contextualising the difficult aspects and concepts in Scripture which, poses a real challenge to the modern way of thinking. For instance, religious modernists will find the passage of the Devil tempting Christ enormously difficult to come to terms with, because it raises all sort of questions as to how exactly that temptation took place, whether there was an actual Devil or as most of them would choose to believe that it was all in the mind and Jesus never saw an actual entity or being called the Devil. When you start buying into the idea of a figurative Devil and not an actual one, then it is easy to conclude that there is no such a thing as the spirit world hence, no need for spiritual warfare. Humility brings us to recognise that our view of the world should be shaped by the counsel of God's Word. 8 For my thoughts are not your thoughts, neither are your ways my ways, saith the Lord. 9 For as the heavens are higher than the earth, so are my ways higher than your ways, and my thoughts than your thoughts. Many even within the Church have displayed not only a tendency but a desire to stray from Biblical truth. They suppose that by ascenting to a none existent spirit world view, it would make it the Gospel more credible. In truth, the Gospel narrative is predicated on an ongoing spiritual battle that existed prior to the fall, in which man became a willing partaker of sin, and could only be redeemed through the LORD Jesus Christ. To be in doubt of this would leave us prone to the spirit of error and ignorant of ungodly spiritual forces at work against us. Since God’s thoughts are not our thoughts it remains for us to understand His thoughts and ways from the Bible in order to draw a proper view of the world, one that is from the perspective of God's. In this we see that although the Biblical world went through many turbulent tumultuous times historically, politically and religiously; the reason for Jesus coming was not to redeem history, politics or religion but to redeem mankind from sin and the works of the Devil. In order for Jesus to do so and realise the redemptive master plans of God, He had to confront and subdue the Devil who Scripture describes as the god of this world. 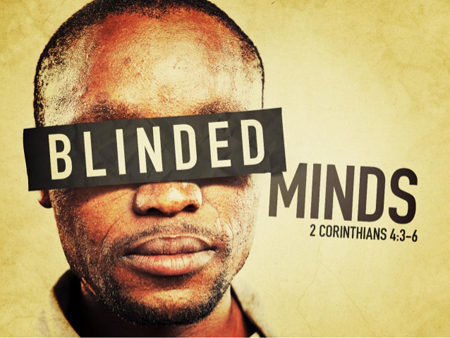 3 But if our gospel be hid, it is hid to them that are lost: 4 In whom the god of this world hath blinded the minds of them which believe not, lest the light of the glorious gospel of Christ, who is the image of God, should shine unto them. Where it says world should not be confused with the planet earth. Indeed, the word earth is not intended in the above Scripture. The Devil is not the god of the planet earth, but one whose influence shapes cultures, societies, politics, traditions and perverse social norms to the detriment of mankind's soul. Put simply, the Devil has the capacity to influence this world by instilling his rationale upon mankind in order to pervade and corrupt our value systems, and bring that into direct conflict and opposition to the values of God's kingdom. 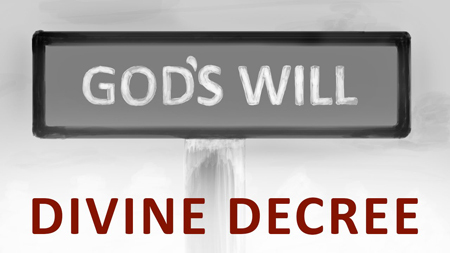 Since the Devil is the god of this world, the careless who do not submit their lives daily to the will of Christ are easily brought under the influence of the Devil's wicked works, leaving them further exposed to being spiritually manipulated. When spiritual manipulation is enforced that which is brought under the influence of the Devil and other subversive spirits will act contrary to the ways and will of God; sometimes without even knowing or accepting it to be wrong. It is for this and other well evidenced reasons in the Bible that God does not see a world shaped by science and reasoning; but one under spiritual subjugation by the Devil and other subversive spirits. Consequently, it is also the reason why the LORD Jesus came to redeem the world. Since the Scripture is clear on the diagnosis of the problem facing this world, what should be the response of believers. The Scripture commands believers to be strong in the LORD and in the power of His might and issues a set of further imperatives that will equip believers to do battle. The amour of God may appear to be largely symbolic in the physical world, but they are mighty protection to have on in the spirit realm. Without this armour, it would be impossible to fulfil the imperative that follow which is to stand against the wiles of the Devil. The armour of God useful purpose is demonstrated in what it is intended to do. When properly deployed, the armour of God will enable believers to resist the onslaught of the Devil and his cohorts of darkness. The onsluaght of the Devil and his cohorts of darkness includes many attempts to deceive, manipulate, oppress and subvert believers to succumb to their ungodly powers. The Scripture identifies the spiritual adversaries of believers and reinforces once again that our battle is not against physical opponents but highly sophisticated spiritual adversaries of varying degrees of ability, strength and propensity for wickedness. The armour of God also provides a direct response that counters every onslaught the Devil and his cohorts of darkness can muster. In particular interest to the Devil and his cohorts of darkness is the ability to manipulate believers to adhere to lies and deception of all sorts, and to counter such weapons the truth of God as a belt holds the enitre armour in place. The breastplate of righteousness provides another important covering for believers. When believers fall into deception or are manipulated to the extent that they then fall out of favour with God, they become susceptible to hostile spiritual forces and therefore prone to demonic attacks. The basis for which any believer in Christ can exert authority over the antics and works of the Devil must be evidenced alone on the account of the Gospel. It was after all, through Christ that believers receive authority to preach the Gospel and all that it entails. Attempts to syncretise or amalgamate strange customs and practices with the Gospel imperatives in an effort to subdue the works of the Devil will only prolong and further strength the works of the Devil. The Devil and his cohorts understand the authority of Jesus and will comply with it. Believers must be clear in their minds by what and whose authority they are engaging in spiritual warfare, and that must never be conflated with customs or practices that regresses into demonic territory. A potent weapon of the the Devil is the ability to strike doubt and fear into believers minds, which can lead to not only questioning the authority of God's Word, but to doubt His integrity altogether. We need to believe in God's Word for our own good and to give one specific example, by holding on to the Word of God, in particular promises He has made, we are able through faith in Him to alter the course of our destiny for the good. This is why the area of faith in God's Word is so important to the kingdom of darkness, and if they can cause you just to doubt a little or incapacitate you with fear, it can lead ultimately to a state of hopelessness and missing out on the things God wants to accomplish with you. The helmet of slavation is perhaps the most delicate armour because it speaks right into what has been accomplished on our behalf. If the head is exposed in physical warfare without any protection then all it takes is for one fatal strike by the enemy to cause serious fatality or even death. If the Devil and other hostile spiritual forces can get believers to question their salvation or even doubt it, worst still renounce their faith; how can that person stand any chance of victory in spiritual warfare? In spiritual warfare, the rules of engagement demands that in order to enter into the arena of spiritual battle, you must come under authority as attempting to do so in your own authority is utterly futile. The Devil and his cohorts of darkness are clear on the authority of Jesus Christ and even though they do not like it, they comply with it. Salvation in Christ and confessing Jesus as your LORD and personal saviour lays the foundation for any spiritual undertaking that can have profound and lasting effect on the works of the Devil. The authority of the LORD Jesus provides you with the necesssary and much needed cover to engage yourself in spiritual warfare. 13 Then certain of the vagabond Jews, exorcists, took upon them to call over them which had evil spirits the name of the Lord Jesus, saying, We adjure you by Jesus whom Paul preacheth. 14 And there were seven sons of one Sceva, a Jew, and chief of the priests, which did so. 15 And the evil spirit answered and said, Jesus I know, and Paul I know; but who are ye? 16 And the man in whom the evil spirit was leaped on them, and overcame them, and prevailed against them, so that they fled out of that house naked and wounded. 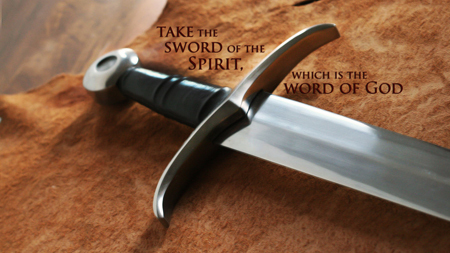 The Sword of Spirit is the knowing how to correctly apply the Word of God in the context of spiritual warfare. This often involves declaring that Word or promise or or faith God has enabled in you. A two edged sword meaning the sword can cut both ways. In practical terms this implies that just as you are able to use the Word of God in spiritual warfare, the Devil and his cohorts of darkness can also use the Word of God against you to mostly heap guilt, condemnation and a feeling of unworthiness most especially if you are not living right with God. However, this scenario is unlikely when the whole armour of God is applied correctly, in which case the Sword of the Spirit can only be used against the hostile spiritual forces. 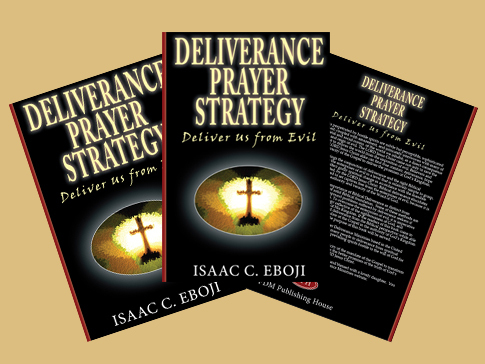 The main objective and purpose served by spiritual warfare is really quite simple - you battle in prayer to subvert hostile spiritual powers and their wicked works. You conduct this battle fully covered in the armour of God, this armour is not physical but spiritual and is given to Christians to glorify God. 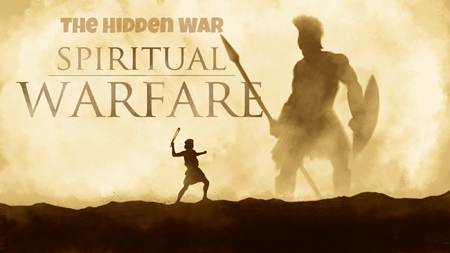 Spiritual warfare requires a different mindset compared to how you would conventionally tackle other battles of tanible nature. The often intangible nature of spiritual warfare calls for a mindset conditioned by the actualisation of God's Word, if the intransigence of the natural mind is to be overcome.